A new version of Ardesia (0.7) has been released that brings Interactive Whiteboard Common File Format support, truly respecting open standards. 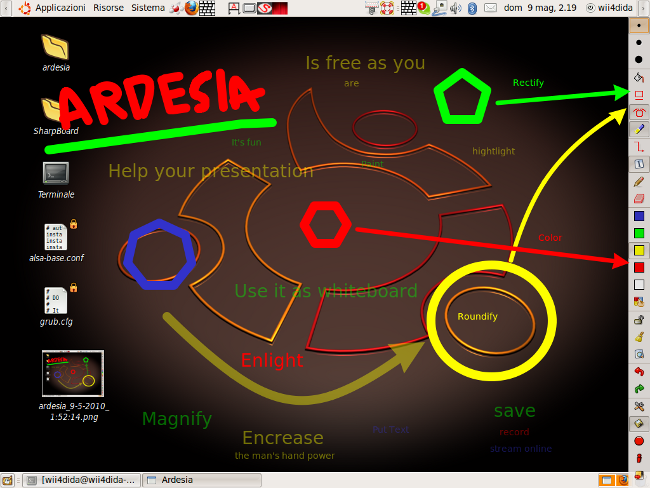 "Ardesia is a free and open source application that turns your desktop into a digital sketchpad allowing you to draw hand annotations, do some artwork, carry out interactive presentations, record your drawing sessions etc. The application is useful for artists, students and professionals or can be just used for fun. Ardesia supports a number of devices that include tablets, tablet PCs, wiimote whiteboard and other touch devices." IWBCFF is an open file format that allows file interoperability between various interactive whiteboard applications. Since Ardesia now supports this format, you can save and reopen your own work for re-editing or you can use these files to open them with another whiteboard application having support for IWBCFF. IWBCFF have already gained much acceptance among whiteboard vendors and has almost become an industry standard. Other changes in version 0.7 include updated installers for Windows.